In this article, we are going to show you gardening ideas using pallets. These ideas for sure will inspire to include pallets in your next gardening thought. Let’s take an example measurement of a living wall, and you can make your own accordingly. According to the design plan, each part if 60 degrees tilted towards the front. The length of the Wall can be adjusted according to the space you have. Use a black plastic bag, fold them around the corners and pin it. By this, you could make it as a waterproof tray. You love to grow your plants upwards; then this DIY is for you. It consumes only less space. This can be used when you live in a small area. Excellent choice for small herbs you want to grow in your garden. Reason being easy to transport and easy to construct, these are ideal choices to grab a lot of attention towards your garden. No big investment needed too. This pallet can be used as vertical flower garden to grow your favorite flowers along the porch or in even on the back side of the door. Because Pallets could be easily trimmed down according to the space available, it can be used anywhere efficiently. Have your flowers hung up using these pallets, where ever you wanted. In Herb Pallet Garden, use chalkboard paint so that the herb garden could be labeled and easy to track. 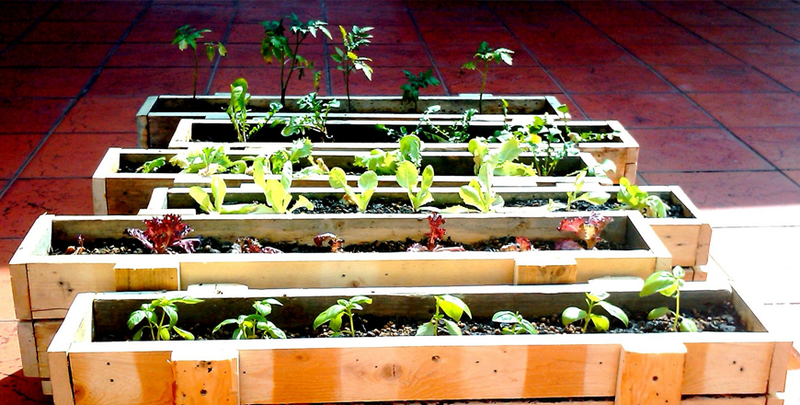 Pallet Garden is very easy to construct and gives a lot of access grow space. All you need is multiple stacks and dirt. This will help to grow the garden all sides of the pallet. Love to hear more from you, leave us your valuable feedback. !